S8 from the house of Audi is undoubtedly a powerful luxurious sedan with its looks, features and performance figures. But the tuners never sit for what they get from automakers; they always have something inside their box for the speed and luxury lovers. This time ABT Sportsline engineers worked their plans upon the model and are all set to bring the ABT Sportsline Audi S8 2014. With impeccable hike in its total output the model is expected to be a benchmark in future. Let us have a look at the review of ABT Sportsline Audi S8 2014 to know more about it. ABT decided to use its new power management system to upgrade the ABT Sportsline Audi S8 2014. While upgrading the engine inclusions in ABT engine technology like the ABT Power ‘New generation’ played an impeccable role in hitting the target desired. Not only this new muffler system brings aggressive roar and makes your ride thunderous. To take this entire rumble, new set of 21” DR alloy wheels are added which matches the color of body and the darkness thus created spreads the desire the rule. However buyers also have an option to go for 20” ER-C wheels drenched in silver-bullet or Gun-Metal color. 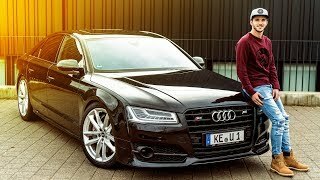 Rounding up the details of ABT Sportsline Audi S8 2014 all we can say is, the upgrades and inclusions are made keeping in mind the target total output and we believe this is what ABT is all about. 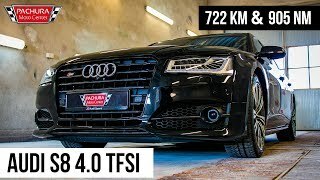 With all its upgrades the ABT Sportsline Audi S8 2014 gets more ferocious and instead of 520 hp and 650 nm now splatter total output of 640 hp and peak torque of 780 nm, through its 4.0 Liter TFSI engine. With these power figures rumbling the streets, top speed of ABT Sportsline Audi S8 2014 knocks down the mark of 174 mph.